This year’s River Symposium was particularly exploring how to develop and further implement synergies and cooperation between different sectors but further efforts are needed to bring the agricultural sector to contribute to integrated projects. 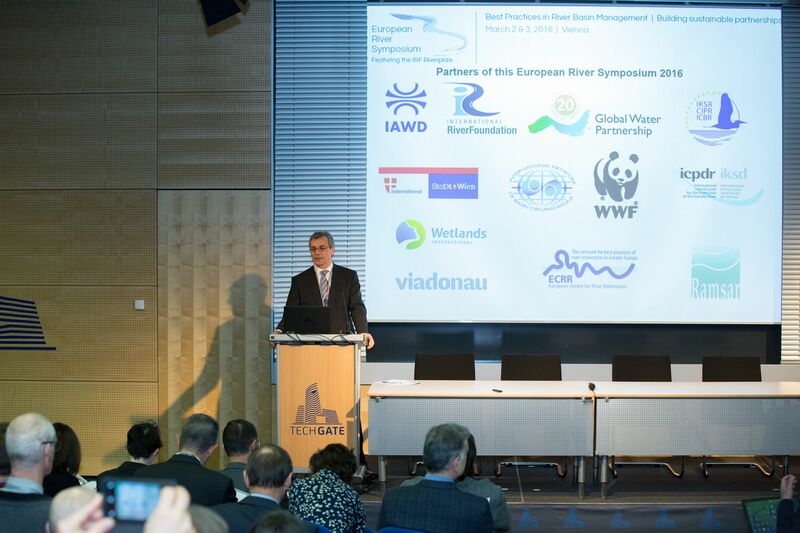 The third European River Symposium was held in Vienna, Austria, from 2-3 March. The conference was attended by 180 registered representatives from government, intergovernment, research and civil society organisations from 34 European countries. The Rivers in Europe, Best Practices in River Management Symposium targeted actions taken to build positive relationships between key organizations and sectors that influence rivers and water management. Along with the conference, the 3rd European RiverPrize, was awarded by the International River Foundation’s 2016 European Riverprize. This year the Segura River of Spain was awarded with the prize. Ramsar Convention is a Partner in the European RiverPrize emphasising the importance of rivers as vital wetland arteries. In most European countries rivers and their floodplains have been heavily modified since the 19th century, for flood control, hydropower generation, navigation and agricultural drainage and irrigation. Especially in flat regions and coastal plains, pressures from urbanization, infrastructure development and agriculture continue to reduce the ecosystem services that rivers and their floodplains could provide, most often for lesser costs (natural solutions) than constructed dams, weirs and embankments. This year’s River Symposium was particularly exploring how to develop and further implement synergies and cooperation between different sectors, notably nature conservation and river and floodplain restoration, hydropower, navigation and tourism. Further efforts are needed to bring the agricultural sector to contribute to integrated projects and programmes.